You’re not alone. Millions of Americans are dealing with credit card debt every day. Paying your credit card bill is like coming face to face with your past self. Every month, you’re forced to reckon with the choices your past self made, and those choices can come at the expense of both your wallet and your well-being. Sure, credit cards give you the freedom to spend as your heart desires. 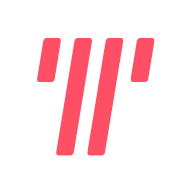 If you want to do some online shopping from the comfort of your couch, you can. Credit cards make that possible (though your future self may not be thrilled). They can also help get you out of a bind. Whatever the case may be, your credit cards are there for you. But credit cards are also an undeniable source of anxiety — credit card debt exceeded $1 trillion this year for the first time in U.S. history — and that caught Tally’s attention. Tally conducted a survey of more than 1,400 Americans to learn more about the psychology behind credit card debt. Respondents were asked about the details of their various financial situations and, more importantly, how their credit cards make them feel. The results were staggering: Half of those surveyed, regardless of the state of their finances, said they experience some form of anxiety over their credit cards. In many cases, Tally’s survey respondents experienced levels of anxiety over credit cards comparable to the anxiety of people awaiting medical test results. For those surveyed, credit card debt was clearly the primary anxiety driver. 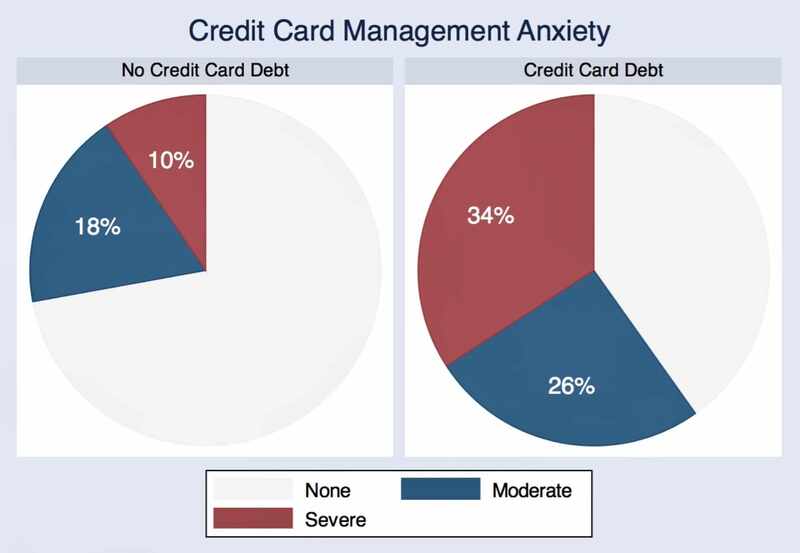 The survey also shed light on key questions about those who experience anxiety over their credit cards: Who experiences the most credit card anxiety? What factors affect credit card anxiety levels most? And are there ways to overcome credit card anxiety? Tally found that 60 percent of people with credit card debt experience anxiety over their credit cards, as do 28 percent of people without credit card debt. Credit card anxiety isn’t unique to people in debt. Half of all respondents in Tally’s survey said they experience some form of credit card anxiety, regardless of whether they are in debt. Reported anxiety increased for those who are in credit card debt, with 60 percent of respondents experiencing some form of anxiety. Perhaps most telling, however, were the responses from people without debt: A whopping 28 percent of people with no credit card debt said they experience anxiety despite carrying no monthly balance. Tally found that people’s anxiety over credit cards increases with the amount of debt they owe. As debt grows, so does anxiety. This conclusion may seem obvious: The amount of credit card anxiety a person experiences is proportional to the amount of credit card debt they have. Of the respondents with less than $1,000 in credit card debt, 48 percent said they experience some form of credit card anxiety. When that debt increases, the anxiety follows. Fifty-nine percent of people who have between $1,000 and $5,000 in credit card debt said they experience anxiety, and that number jumps to 71 percent of people when the debt is greater than $5,000. Tally found 52 percent of people with an “excellent” credit score experience anxiety about their credit cards, compared 67 percent of those with a “good” credit score. Money can’t buy peace of mind. High earnings and a high credit score are two indicators of financial well-being, but they don’t tell the entire story. Nearly half of the respondents who earn more than $100,000 annually said they experience credit card anxiety, while 65 percent of those who earn less than $100,000 also experience anxiety. Similarly, 52 percent of people with an “excellent” credit score (720 or higher) said they experience anxiety, and 67 percent of those with a “good” credit score (660 to 719) experience anxiety about their credit cards. Bottom line: When it comes to anxiety over credit cards, you’re not alone. There are millions of Americans dealing with credit card debt every day. And, as evidenced by Tally’s anxiety study, it’s not always the people you expect. Based on these questions, participants rate themselves on a four-point scale: almost never (1 point), sometimes (2), often (3) and almost always (4). The points are then tallied up for a single score, with higher scores correlating with greater anxiety. Tally conducted four surveys of 1,418 qualified respondents between January and February 2017. All respondents were between the ages of 25 and 45, had a FICO score of 660 or higher, annual income of $25,000 or more and had paid at least one credit card bill within 30 days of the survey. All surveys were conducted using SurveyMonkey, Google Consumer Insights and PollFish.